Rubbed Pork Tenderloin, Thyme for Cooking summer main course. Mix all ingredients for rub and rub on pork. Mix all ingredients for sauce. 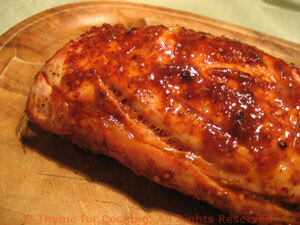 Put pork on barbecue grill or in 400F oven for 25 - 30 minutes. Turn occasionally to brown on all sides. When you think pork is done slice into middle to check. Slightly pink is perfect.